you can camping in Seoul. 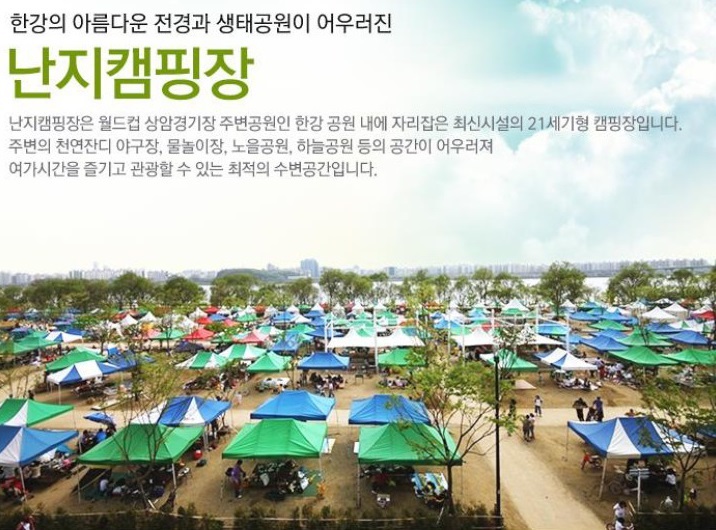 You can camping on Han River. so you can picnic and camp. You can enjoy simple cooking and barbecue at lunch or dinner without using a tent. You can use it on the same day visit without reservation. Admission tickets for the day (4,000 won per adult) can be purchased at the picnic area. It is available from 9:30 am to 9:30 am the next day. You can hire a tent or reserve a rental tent and then camp. I use it after reserving the Internet advance. Saturdays and Sundays are almost sold out. It is available from 11:00 am on the day to 9:30 am the next day. Camping campgrounds are divided into "self-tent" area and "rental tent" area. For those who bring a tent separately, 15,000 won per site (including four basic admission fees) can be paid. By Bus: Take the No. 9707 from Dangsan Station Exit 8 of Dangsan Station on Line 2, and get off at Hanganggang Park, one stop.